Have you ever laboured over baking a fruit or meat pie only to be disappointed when the crust comes out soggy and unappetising? This problem is caused by the hot moist filling being absorbed into the dough as the pie bakes. 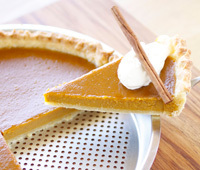 Techniques like pre-baking your crust before adding the filling, called 'blind baking', can help make the crust crispier. But it adds more time to the baking process as you need to cook once, allow the crust to cool before you can add the filling, and bake a second time. Other techniques like lining the inside of the crust with melted butter and refrigerating, or covering the crust with beaten egg, also take time and extra ingredients - with no guarantee of success! Why spend time double baking or trying risky techniques when you can use SimmerMat's new Crisper Pastry Pie Pan. Everytime - all with just one baking, without the need for extra ingredients. Made from durable plated tin, the Crisper Pastry Pie Pan won't shatter or break like glass or ceramic pans can, making it a safer to use in your kitchen and longer lasting. Your Crisper Pastry Pie Pan can go straight into your dishwasher with regular dishes. 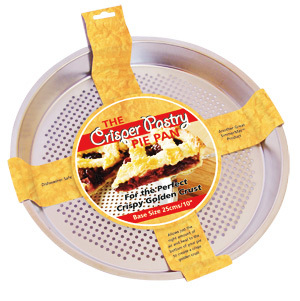 In fact the specially designed perforations in the Crisper Pastry Pie Pan will not only crisp the crust, but will enable the pie to come out of the pan cleaner and easier. Outer: 271mm / 10.63 in. Inner: 255mm / 10.04 in. Rim: 8mm / 0.312 in. Pan Depth or Height: 30mm /1.18 in.